Nutritious Gluten Free Blueberry Pancakes . . . The struggle is real y’all. I’ve spent a year testing out every fancy GF pancake mix and “from scratch” recipes made up by yours truly, armed with my crazy, geeky knowledge of only the most nutrient dense ingredients. I failed at this so many times and wondered if a fluffy, delicious and nutritious gluten free pancake could exist in our world, without being flat like a crepe or utterly tasteless. So here it is. Pancakes made from…. Garbanzo flour?? Yep. You got it. 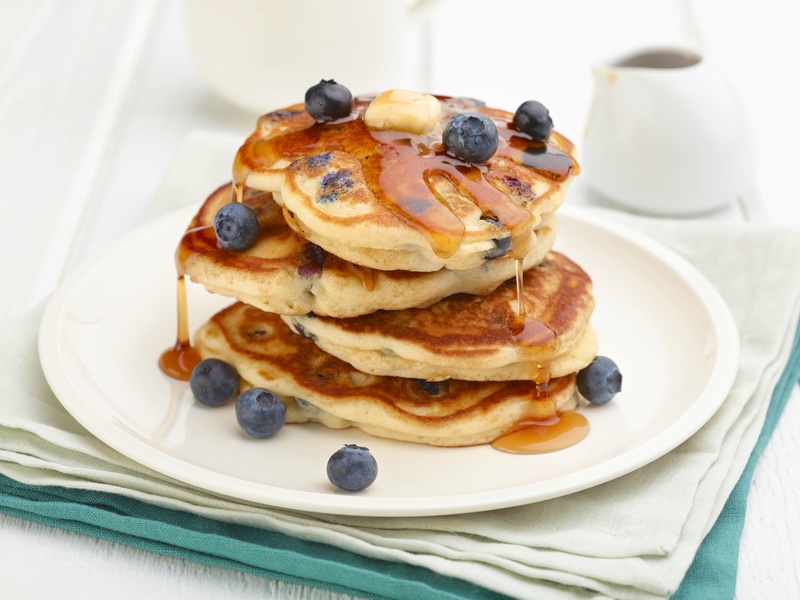 Start with this mix: Authentic Foods Gluten Free Pancake Mix http://www.vitacost.com/authentic-foods-gluten-free-pancake-baking-mix-1-25-lbs. Do not confuse this with their gluten free all purpose flour. Ingredients of mix are as follows: Brown Rice flour, Garfava Flour (Garbanzo), Baking Powder, Sea Salt and Vanilla. In a large mixing bowl, whisk together 2 organic, pasture raised eggs, (replace eggs with 2 pureed bananas if Vegan), 1 cup unsweetened almond milk, 2 tablespoons of melted coconut oil (I melt it quickly in a non-toxic, non-stick pan before starting, then use the remaining oil to cook them in) 2 tablespoons of Raw Coconut Sugar (the only sugar that doesn’t shock the body besides date sugar) and 1 teaspoon of non-alcoholic vanilla extract. All of these things can be found at Whole Foods or at http://www.vitacost.com. Once all of this is mixed together, slowly stir in 1 cup of Pancake Mix. Allow to sit for a few minutes while heating up the skillet, which should have a thin layer of coconut oil. Pour batter into skillet using med to high heat. I like to make one large pancake at a time, but size of pancakes is up to you. After a minute or so, drop in and scatter a few fresh, organic blueberries on top. Once the pancake starts to bubble, flip and cook until there is no longer batter in the center of pancake. Lower the heat if necessary. Remove and cover with REAL maple syrup. PS. The batter is deceiving and looks and tastes like garbanzos, so I was completely shocked to discover how amazing they are fresh off the griddle. There you have it folks. Eat Clean. Be Well.